This is a really simple way of making a pressure flaker. 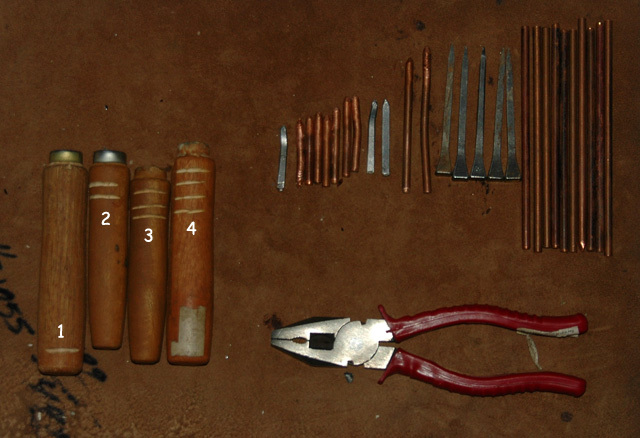 As you can see in the picture I have four empty tool handles bought from a DIY shop. All have been drilled to a different depth, I discovered this by testing them with a long nail before I purchased them, This was a lucky find admittedly, if you can't find tool handles drilled to different lenghs, buying a single length and stuffing the holes with paper well as a way to reduced the depth of the hole and is quite removable if you ever need to adjust it by filling the hole with water till the paper goes soft, then scraping it out. An alternative method is to buy a broom handle cutting and drilling it yourself, or for the patient, go to the woods, find a piece of fallen wood, saw it into four pieces and press a nail into the soft centre of the wood to four different depths, then let it dry in a warm room for a few months. Now to knap I simply place a long nail into the flaker 1, when it wears down too short to use I remove it with the pliers and insert it into flaker 2. I continue to do this down to flaker number 4. Simple but effective,that's how we like it. Have recently found a large size nail with the head cut off and set in a file handle works rather well too,it's nice soft steel, cheap and shaped to a point already. scroll down till you get to the Abbey Silverline Point Square Bradawl 40mm. They mention many materials it would be good for but miss out the flint! Wouldn't hardened steel be too tough to use on flint? 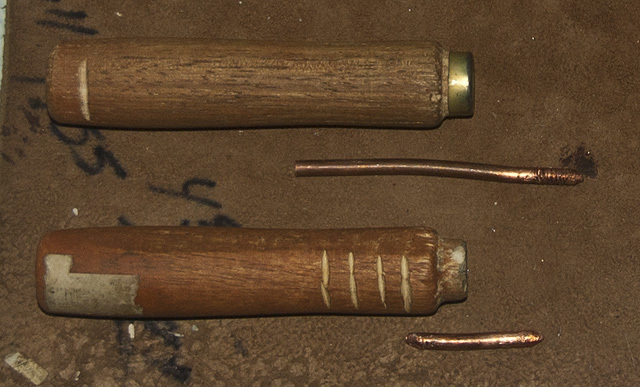 Copper is soft, and so are horse shoe nails, but I've never had any luck with things like screwdrivers, they just slip off. I'm thinking it may be good for tasks like starting off notches or putting denticulate "teeth" on a knife. More downward pressure than in. It did work as a notcher though, and kept it's point after some abuse. As a conclusion, do make your own pressure flakers as they will be much better than any "off the shelf" awl, and as a new spare file handle can be bought from most good diy shops for around £1 and a section of copper rod (or indeed an end of a large steel nail) can be fitted into it for little more, much better by far. The awl now joins my growing heap of "pointy steel things with a file like handle" pile. It may be useful one day.